you don’t want anybody to see and know your network’s name. For example, if the the name of your corporate Wi-Fi is your company’s name, your personal name or your apartment’s number, etc. you want to take an additional step to improving the security of your network. SSID serves as a login while the wireless security key works as a password when connecting to a wireless network. Usually a client should enter only the password to connect. But when the SSID is hidden someone who wants to join your hotspot needs first to correctly input the name and only then – a correct password. But note, that if a person is a skilled hacker, hiding your SSID won’t help at all. 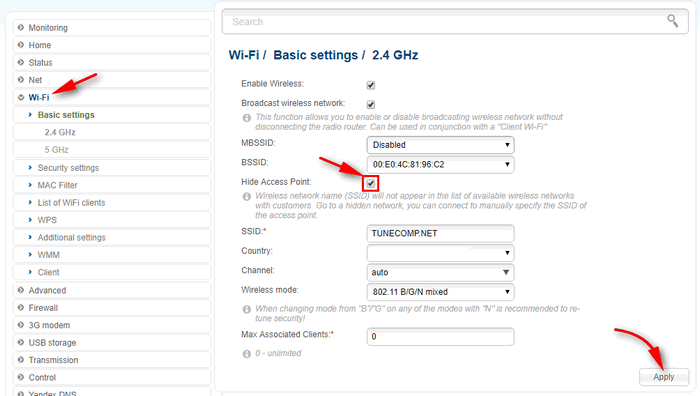 Here is our step-by-step guide on how to disable SSID broadcast on your Wi-Fi router or access point. First, you need to log in to your router’s (or AP’s) settings page in the browser: Here we wrote about how to find router’s IP using your Android device. 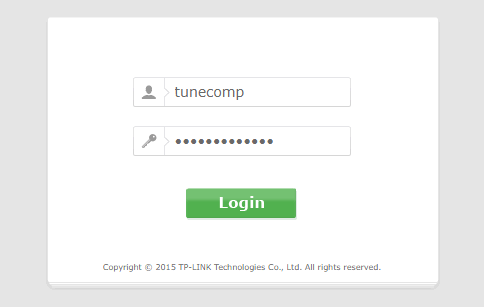 And here is what you can do if you cannot log into the web interface using default IP-address. Find the page related to the wireless security. Now you need to turn off the SSID broadcast to hide your network name. Here is how it looks like on routers of different manufacturers. 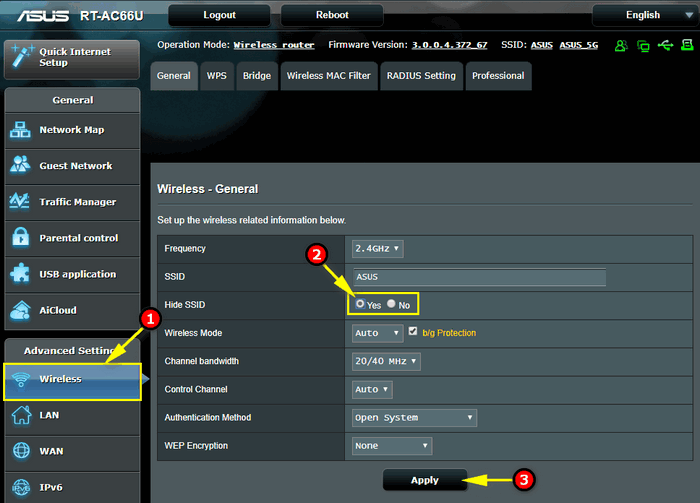 Be sure to save router’s settings in order to apply changes! In most cases you will need to reboot your router to apply changes and make your Wi-Fi network hidden. 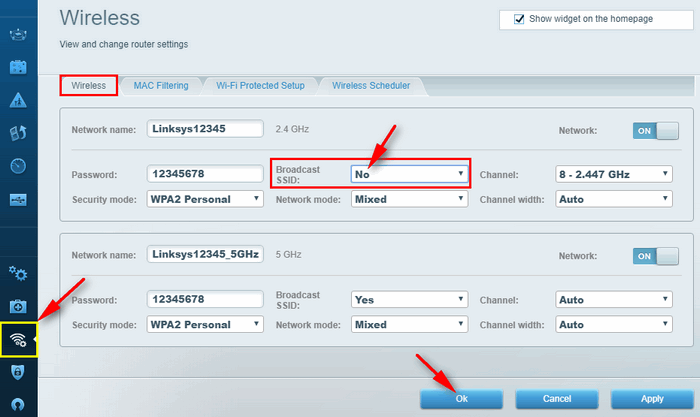 Can I Hide SSID For 2.4 GHz Network And Broadcast Name Of 5 GHz Wi-Fi? YES. You can hide SSIDs of 2.4 GHz and 5 GHz networks independently from each other on your router. I mean you can disable the name broadcast for 2.4 GHz network but leave it enabled for 802.11ac Wi-Fi. The same applies to guest networks as well. In my office I disabled SSID broadcast for my 2.4 GHz and 5 GHz work networks but enabled it for my two guest hotspot on my Archer C9. 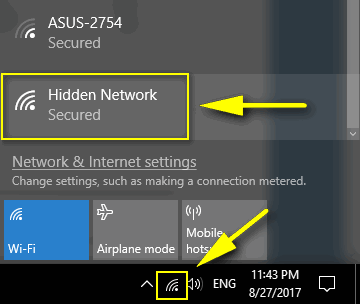 Read about how to connect to a hidden Wireless network on Windows, iOS and Android.